Mahmud Ali Al-Banna was a renowned Egyptian reciter. He was born in a village called “Shobrabas” in the north of Egypt on December 17, 1926. Mahmud Ali Al-Banna memorized the Qur’an at the age of eleven from his master Sheikh Mousa Al-Muntash. He then moved to Tanta to study Theology in Al-Ahmadi Mosque from Sheikh Ibrahim Ibn Salam Al-Maliki. In 1945, Mahmud Ali Al-Banna moved to Cairo and started gaining fame. In Cairo, Mahmud learnt music and Maqamat from Darwich Hariri. Later, he was chosen by Young Muslims Association as a reciter till he was noticed by Maher Bachah, Prince Abdul-karim Al-Khattabi and invited to join the official radio station in 1948. Shortly, he became of the most acclaimed reciters of Egypt. At the late 1940s, Al-Banna was leading prayers in Ain Al-Hayt Mosque, in Al Rifa`i Mosque during the 1950s and then in Al Ahmadi Mosque in Tanta by 1959. In 1980, he recited the Qur’an in Al Imam Al Hussein Mosque till he died. 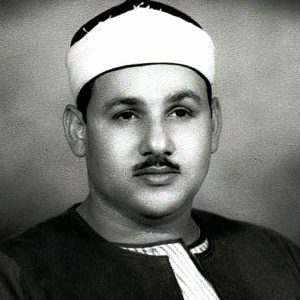 Sheikh Al Banna published his Qur’anic recitation in 1967 together with other recordings including his recitations in the Egyptian, Saudi and Emirati radio stations. He also recited the Qur’an in the Grand Mosque of Jeddah, the Prophet’s Mosque, the Omayyad Mosque, Al Aqsa Mosque and visited many countries across the world including Germany in 1978. Sheikh Mahmud claimed for a long time creating a reciters’ syndicate for which he was president in 1984. Sheikh Al-Banna died on Du Al-Qi`dah 3rd, 1405 ( July 20, 1985).